Last post 03-21-2012, 10:45 AM by Tux. 22 replies. 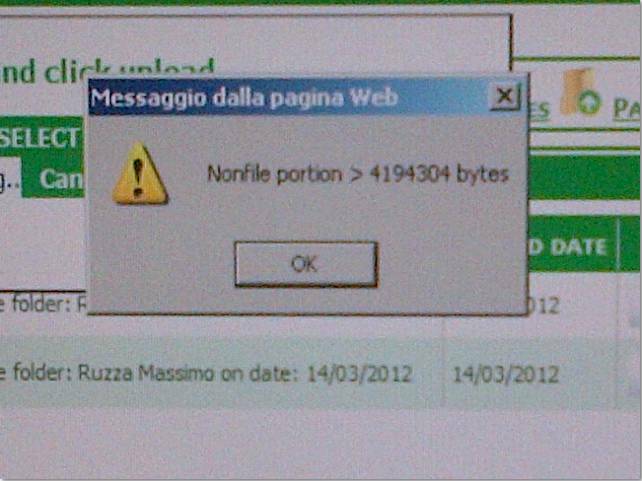 this is the error that some of our customers report on their PCs (see the image below). It doens't occur on all the PCs, and it doesn't occur on our development servers, thus it's very difficult for us to understand the cause of the problem. The customer reported that, on the PCs where the error occurs, uploads of files with a size smaller than 150 KBs are always succesful, but a greater size than that generates the problem. We still have to verify this feedback, but it might be a clue. It's confirmed, the file size makes the difference. In some PCs of the customer (not all of them), if they upload a file smaller than 150 KBs, the upload works fine, if the size is greater then 150 KB..... error! Can you create a page by the code below and let your client test it? Does it get the same issue? And let him disable the Anti-virus and firewall to test it too. I will create this page and let the customer test it. I will ask them to disable the Anti-Virus and the Firewall. I will let you know the result ASAP. During the test, the Firewall and the Anti-Virus were disabled. The result is the same: Object reference not set to an instance of an object. Please let me know what we could do to solve this issue. Is your site on a load balancing environment? Does your client get the same issue on demo page http://www.ajaxuploader.com/Demo/select-multiple-files-upload.aspx? Can you send me the url of your test page abouve? So we can check it too. And please refer to http://www.ajaxuploader.com/FAQ.htm#16, "How do I handle a large file upload?" section, ensure that the configuration is correct. 1) Is your site on a load balancing environment? 2) Does your client get the same issue on demo page http://www.ajaxuploader.com/Demo/select-multiple-files-upload.aspx? 3) Can you send me the url of your test page abouve? So we can check it too. 4) And please refer to http://www.ajaxuploader.com/FAQ.htm#16, "How do I handle a large file upload?" section, ensure that the configuration is correct. 1) Yes, it is. We have two Web Servers under load balancement. 2) We will ask them to test it, I'll let you know. 4) Ok, I will read it, and eventually report back to you. But I think that our configuration is correct, since the customer is able (on the PCs where the problem doesn't occur) to upload files even larger than 10 MBs. Please refer to http://www.ajaxuploader.com/FAQ.htm#16, "How do I handle a large file upload?" section, ensure that the configuration is correct. Ok, I will read it, and eventually report back to you. But I think that our configuration is correct, since the customer is able (on the PCs where the problem doesn't occur) to upload files even larger than 10 MBs. - maxRequestLength: in our web.config we didn't customize this attribute, so I guess we use the default value (4 MBs). Could this be the problem, considering that the size limit of the error is just 150 KBs? 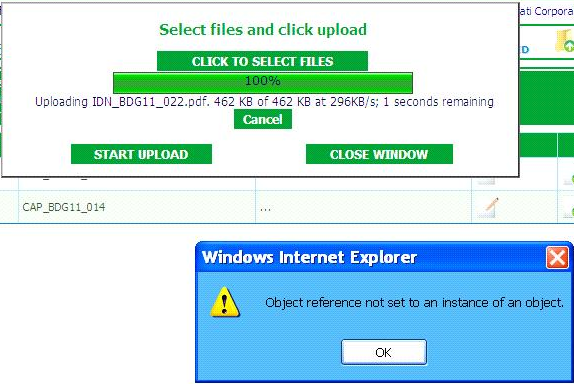 - IIS7 and large files: on our Web Servers we have IIS 6.0 installed. On the load balancing environment, you must set a UNC path for uploader as the TempDirectory, and must use the same location. On both servers, the uploader must use the same Temp Directory(mean that, if uploader which on server "A" use '192.168.1.123/photos' as the TempDirectory, the uploader on server "B" must use this folder as the TempDirectory too). thanks for your answer, we will follow your instructions and I will let you know the result as soon as possible. The customer tried this page on one of the machines where the error normally occurs, but this time the upload was successful. I didn't have the time to investigate further on this problem, but now I have the time again. The situation didn't change, unfortunately, our customer still experiences the problem. It occurs only for uploads with a size superior than 150 KBs and only for two users in the customer's company. What else could we do? Maybe I made a mistake, and I didn't specify that our Load Balancer is not a software LB, is a hardware one, on a different server. Maybe there's some http modules have conflict issue with the uploader . I suggest create a new IIS application to test it . With the default configuration of ASP.NET over IIS , No extra IIS/ASP.NET modules. we checked the configuration of our IIS website, and it doesn't use any extra IIS/ASP.NET module, but just the default configuration of ASP.ENT over IIS. - NT User 1 tested the upload on Machine 1 and the result was OK (no errors). - NT User 1 tested the upload on Machine 2 and the result was KO (the error occurred). NT User 1 was the same on both machines, and Machine 2 is the computer of one of the two users of our customer's company who are experiencing the problem since months. Then we assume that the problem is strictly related to the machines, not to specific NT users or HTTP modules. Please help, the problem is becoming stressfull for our customer. I am not sure what's wrong now. because I can't reproduce it on your website. please add this into web.config and try again. it will show a debug trace box , when get error , please copy the text and paste here . Hi Terry, thanks a lot for your kind answer. We have just modified the web.config on our two WebServers, adding the UseAspNetStream key. Our user will test the upload again and we will let you know the result. If the error will still show up, the user will make another test using the debug mode on the TestUpload.aspx page, as you suggested. Does this help you understanding the cause of the issue? Anyway, this friday I'll pay a visit to our customer and I will perform an upload using the UploaderDebug=1 mode, and report the result back to you. Just one question: in case of error, will I have the time to copy/paste the debug trace, or will the page automatically refresh, removing the contents of the debug panel? When use the 'UseAspNetStream' mode , the uploader will stop intercept the input stream . please change it to a larger value . Is there something else that we have to change? Can you post your web.config ? Make sure there's no other upload components.